because I’ve boiled it down to a repeatable, easy-to-use system, which I implement LIVE with you. and “Icons of Influence” use to grow their authority — and their bottom line — predictably, safely, and profitably without costly campaigns or complicated funnels. and, generating a significant amount of revenue through the almost effortless sale of your products, programs and services. If this sounds appealing, then please pay close attention to what I’m about to share. Before I tell you all about it, I want to make sure we’re on the same page. From: Steve Olsher, San Diego CA. A big hello to you, my fellow business owner. I’m really glad you’re here! The online world has become a noisy, messy place. Competition for attention is fierce. The incessant blitz of ads never stops. It’s not your imagination — It IS becoming harder and harder for your message to reach your perfect client. If they only knew you existed. IT’S ALL THAT MATTERS. HOW DO I KNOW? First, let me introduce myself if we’ve never met before. My name is Steve Olsher. I’ve been an online entrepreneur for more than 25 years and own several 7-figure+ businesses, working just 3 days a week. I wrote a New York Times bestselling book. I’m the creator of The New Media Summit. And, currently, I host 2 top-rated podcasts, Reinvention Radio and Beyond 8 Figures. Nothing has moved the needle for the growth of my authority presence, and the growth of my business as a whole, more than one thing. No. Not the old, bloated way of generating visibility through old school media. With the old way, you had to hire a PR agency who would charge you THOUSANDS of dollars per month for 15 minutes of fame. … PODCASTING (with a twist)! Every day, this underutilized strategy helps me get in front of thousands of buyers. And it has allowed me to elevate my positioning and share the stage with super-gurus like Brendon Burchard, Russell Brunson, Lewis Howes, Vishen Lakhiani and many others. But I’m not talking about starting your own podcast… though I can teach you how to do that (and the numerous benefits doing so can bring you). Nope.I’m talking about a little-used, untapped hack you can leverage to reach thousands of people. Position yourself as an authority. And, consistently (and easily) attract qualified clients like a magnet… when you do it the right way. The best part? It doesn’t cost one red cent… you can do it from the comfort of your couch… spending just a couple of hours (per week) on your mobile phone. Putting $100,000 (or more) into your account. for ‘Podcast’ over the past three years. That’s 90 MILLION adults… in the United States… alone. 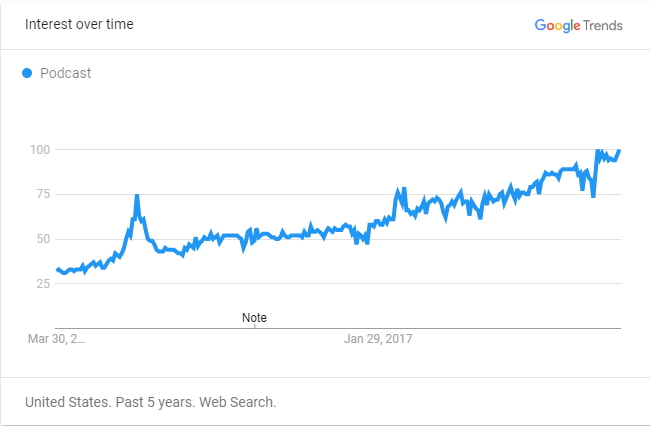 And the interest in podcasts is growing. 64% of Americans have heard of podcasts… and 6 million MORE Americans became podcast listeners in 2018. That number is only going to grow in 2019, 2020 and beyond. It’s simple really. Podcasting has changed the way we consume information, education and entertainment. And, as savvy business owners, we can take advantage of this trend… and profit from it. We can use podcasting to amplify our message. To connect with our ideal prospects, cultivating a loyal, borderline fanatic following. And, to sell our products, programs and services to customers all over the world who will be ecstatic to buy from us and work with us. So… if the rewards of this strategy are so high, why isn’t every business owner doing it? I’ll tell you. I’ve seen three roadblocks get in the way of far too many businesses achieving the visibility, authority and success they deserve. And when you appear on high visibility podcasts alongside “Icons of Influence”, you’re doing exactly that. These Icons have spent years building a loyal tribe of fans. Fans that tune in weekly to listen to their shows. And you have FREE access to every single one of them! without sacrificing precious time away from your business or your family. And, if you implement my $1,000 Funnel (which I’ll teach you in Profiting From Podcasts), you too can generate $1,000 (or more) in immediate revenue every time you appear on a show. So, all you need to take advantage of the massive visibility podcasting offers is a Mouth, a Message and a Microphone. 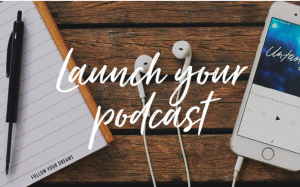 If you’ve made it this far, you ALREADY know that starting to harness the power of podcasting is critical to the success of you and your business. Sales are higher than ever… Every time you appear on a podcast, your inbox gets flooded. People flock to your offers — you even have a waitlist now! The first and only comprehensive online and LIVE training program engineered to get you massive visibility, rock-steady authority status… and the ability to convert that visibility into cold, hard cash! AND, launching, marketing and monetizing your own show. Profiting From Podcasts turns you into your own PR machine, generating opportunities which catapult you from best-kept secret to highly sought-after authority. Now, it won’t teach you how to become a millionaire overnight, diving in gold coins like Scrooge McDuck. while impacting the world more than ever. I’ve invested the last 25+ years working in the trenches and have literally invested millions of dollars over these years to determine what works. 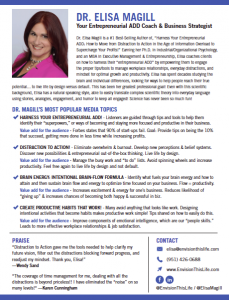 A proven program which has been battle tested and optimized over hundreds of students… from every conceivable area or niche — parenting, business, health, nutrition, healing, pets, education… and many more. It’s your “excuse me” shortcut to the front of the line, steering away from all of the “grind ‘til you have no life” brain damage advice. 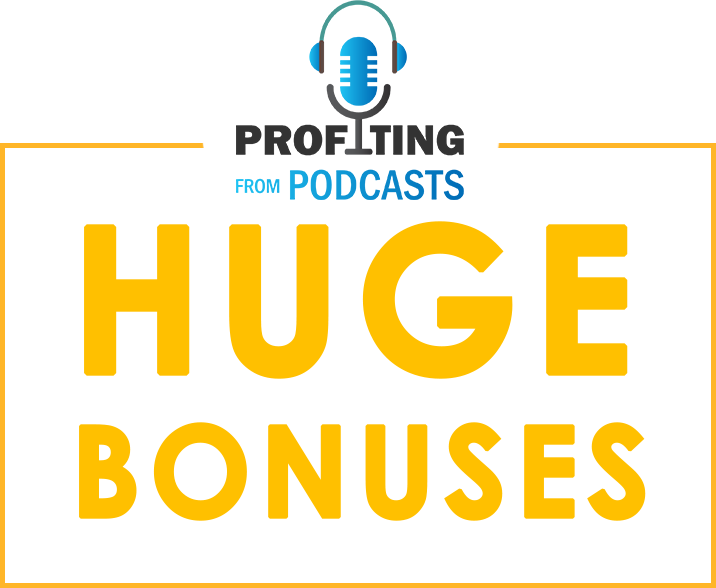 These 9 modules cover the THREE phases of the Profiting From Podcasts methodology. By the end of Phase One, you’ll know precisely how to articulate who you are and what you do. You’ll have the exact language to describe the problems you solve… how you help those who need you most… and why audiences should listen to you. You’ll be able to use this exact language to boost your sales on your website and on your social media profiles. Plus, you’ll have clarity around your unique talents and abilities like never before. At the same time, my team will work with you to create your media one sheet and design it FOR YOU so you have the professional appearance you need. During this phase, you’ll learn how to be an engaging guest that their audience WANTS to connect with and learn more from. You’ll develop and complete your show pitch so that you get consistently booked on the shows YOU want. On our side, our team will help you develop, complete and practice your show pitch… so that you get consistently booked on the high visibility shows you’ll get the most out of. During this phase, we’ll focus on the money. We’ll get you ready to monetize your visibility and have a place to send listeners that looks awesome… adds immediate value to their life or business… and seamlessly flows towards the sale of your products, programs and services. No worries if you don’t have a clue as to what your funnel should look like. We’ll take you by the hand and show you exactly what a highly-profitable funnel looks like. What if you’re a pro and you already have a funnel in place? My team can audit your funnel and help you optimize its performance. We’ll also reveal monetization options you may not be taking advantage of. … we don’t need some encyclopedia of client-getting, authority building or business-development tactics. We need to take ACTION. That’s why I’ve built-in accountability, community and game plans into the program. Feeling alone and maybe a bit unsure how to implement everything you’re about to learn? Want to have a helpful, guiding hand to help you past the roadblocks on the path to growing your business? You’ll hear me deconstruct different businesses, including how to explosively grow their exposure, reinvent their business models, and implement systems to generate 10+ visibility opportunities per week. And you have a front row seat to each and every one of these calls. Imagine how much time, trial and error it will save you by having a mentor who’s been there and done that… one who has a proven, repeatable process laid out from A-Z. The Profiting From Podcasts system includes a thriving support community. There, you can hop on in-between sessions and connect with others in our tribe. Post questions. Find guests for your show if you decide to create one. Even land guest appearances, share resources and much more. Imagine being surrounded by people who want you to succeed, who are there to cheer you on, and who are eager to share what’s working for them. Plus, I constantly check in on the group and provide feedback and guidance, as needed. People ask me all the time if they can join this group and I tell them that the only way in is to be a client of mine. Since you’ll be a client, you get access to a 24/7 community forum for free. THAT’S CORRECT! YOU’RE RECEIVING 2 FULL COURSES FOR THE PRICE OF ONE!! This is a full fledged, incredibly comprehensive, stand-alone course which shows you exactly how to create… grow… and monetize your own thriving podcast, if you choose to do so. From concept development… creating a ‘must listen to’ show that serves the needs of your target market… to launching your podcast on iTunes (and other distribution channels too)… and cultivating a loyal, borderline fanatic following… Launch YOUR Podcast is the ONLY course you’ll ever need to start, launch and monetize your show! 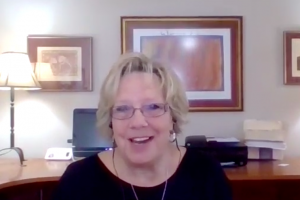 As I said, this truly is the most comprehensive training available for leveraging the incredible power of podcasts… from both sides of the microphone (guest AND host)! Now, I could stop right here and the investment for enrolling in Profiting From Podcasts would still be an incredible deal and just a fraction of the total value of what you’ll receive. To get booked on the world’s leading podcasts, you’ll need a professionally designed media one sheet. This is like handing you the golden ticket to the chocolate factory. My team will work with you and create FOR YOU a detailed, beautiful media document that will contain all of the information producers and hosts are looking for when booking guests. No need to try and hunt down a designer or the right template. We’ve created two AWESOME templates you can choose from and we’ll customize it for you with your info. Now, if you went out and hired a designer to do this, you’d easily invest $1,000 or more. When you enroll in Profiting From Podcasts, you get your media one sheet done for FREE. 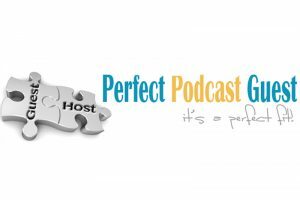 Perfect Podcast Guest is the site more producers and hosts turn to when they are looking for guests to feature on their shows. This is the perfect place to be to start your Profiting From Podcasts journey. You’ll be able to set up your professional profile and have a lifetime listing on this growing platform. This is easily worth $1,000. When you enroll in Profiting From Podcasts, you get it FREE. With everything we’ve included so far, you could see why this would be a great deal at three or, even, four thousand dollars. But… your investment today won’t be anywhere near that amount and it’s about to get a whole lot better! For my entire career, I’ve taken great pride in being decisive and taking action. So, if you’re like me and when you see what you want, you move forward, I want to reward you for doing so by kicking in two HUGE bonuses if you enroll today. CHECK OUT THESE ADDITIONAL BONUSES! ANNOUNCING… PERSONAL ACCESS TO ME FOR YOUR TOUGHEST QUESTIONS. This is personal access to me, which is exceptionally rare these days. If you hit a barrier you don’t know how to overcome, I’m standing by to personally mentor you through the challenge. If you need advice on how to apply one of the strategies you’ll learn in this course for your business, I’m here for you. You’ll see that 20 minutes with me is comparable to a full day with other coaches. In less than half an hour, I will answer your most burning questions or help you lay out a powerful plan of action for getting to where you want to go — using the path of least resistance. Ask me how I’d handle a big-time appearance on a prominent podcast? Brainstorm on the most effective method for monetizing your appearances for scale? Ask me how I used specific systems — like lead generation, closing podcast appearances, switching monetization models — and apply them directly to your business? Nowadays, I am only available for private coaching for either a ½ Day or full VIP day and people pay tens of thousands of dollars to join me. When you enroll in Profiting From Podcasts, you get my expertise for FREE if you are one of the first 50 people to join. FREE! 1 Ticket To Attend The New Media Summit For The First 200 Who Enroll! The New Media Summit is the premium, closed-door conference where you’ll not only connect with, and learn from, 40 of today’s leading podcasters. There’s no other event quite like New Media Summit. It’s specifically engineered to accelerate your visibility process. 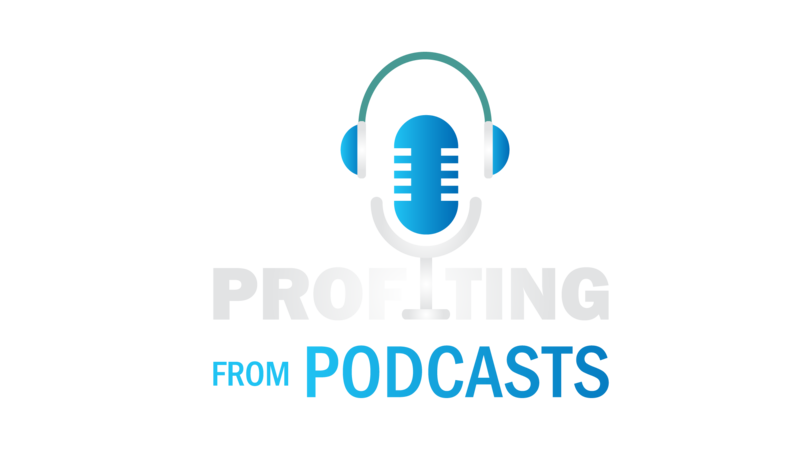 When you enroll in Profiting From Podcasts, you will be able to join us as our guest! Our next Summit is scheduled for September 16-18, 2019 in San Diego, CA. Each New Media Summit is limited to just 150 attendees so that everyone in attendance has ample time to connect with the ‘Icons’. Once September is sold out, you’ll be able to attend the next New Media Summit as my guest. However… only the first 200 to enroll will receive a FREE ticket… so, enroll in Profiting From Podcasts NOW to secure your seat! IS PROFITING FROM PODCASTS RIGHT FOR YOU? I believe in being very honest about who’s right for this program… and who’s not. Business owners who are ready to elevate their visibility and their revenue… are absolutely right for this program. Business owners who have zero ambitions for growing a successful business and don’t want their message to reach the masses… are not. Business owners who have a powerful message to share and are tired of playing small, hiding in plain sight as a best-kept secret… are absolutely right for this program. Not too long ago, a $90,000/year –working just one day a week — opportunity came into my hands. And, I graciously rejected the very generous offer. As I previously mentioned, I own three 7-figure+ businesses… working just 3 days of the week. The rest of the days are for me, my lovely wife and my two boys. By accepting the deal, I would have had to sacrifice one of my free days each week. It was an easy decision to say no. Because I love working 3 days a week. Because I love spending a significant amount of time with my kids and family. And because I love sharing my WHAT and helping those I’m most compelled to serve massively improve the trajectory of their lives… and their businesses. And what has enabled me to create this ‘I wouldn’t change it for the world life and lifestyle’ are the strategies, techniques and tactics I teach in this program. This is my hope for you too..
That you can create your ideal life and lifestyle while growing your business. So you’re able to say NO to opportunities like these too. If this sounds appealing, then Profiting From Podcasts is the right program for you to join. I mean, why not give yourself every advantage available when it comes to growing your business? So, let’s do a quick recap of everything you’ll receive when you enroll in Profiting From Podcasts today. Once you enroll, book your call with me (if you’re one of the first 50 — we’ll let you know if you are) and get started with the training. If, after we’ve had a chance to chat, you’ve joined us for ALL of the live training sessions, experienced ALL of the training modules, attended The New Media Summit, taken advantage of the bonuses you’ll receive and guested on shows following the procedures I teach, you find that you are not profiting from podcasts, simply contact us within 10 days of our final coaching call with proof of participation and we’ll offer you a full refund. You risk nothing by clicking that button and checking things out now. You’ll be taken to a secure registration page where you’ll submit your details and payment information and you’ll receive immediate access to Module #1 of the training as well as many of the bonuses. That’s correct, you can go through the entire training, put the proven Profiting From Podcasts methodology to work for you and your business and begin generating revenue leveraging what you’ll learn… before you’re even paid in full if you choose the 3-pay option. I’m just starting out and am pretty much “unknown”. Why would the podcasters want to interview ME? Most people mistakenly think that a podcast host prefers to interview already famous people. It’s been my experience that many hosts, especially the more established ones, prefer interviewing undiscovered talent or rising stars because the famous folks are often overexposed. In the world of podcasts, NOT being famous actually works in your favor, because most hosts take GREAT pride in being among the first to share new stories, tools, tactics, resources and strategies with their audience. How will I get booked on shows? Three ways: 1) I will show you exactly what to do to find the hosts and producers who are looking for guests EXACTLY like you. 2) You’ll meet 40 of them IN PERSON at the New Media Summit. And, 3) You’ll get a free lifetime listing on Perfect Podcast Guest – the resource more hosts and producers turn to for finding guests. Can’t I just hire a booking agency or call up shows and book myself? The short answer is YES. Of course you can. I am good friends with a number of ‘bookers’ and am happy to recommend several that you can work with. However, even the LEAST expensive agency will cost you THOUSANDS of dollars per month… far more than the Profiting From Podcasts training… and hiring a service won’t include ANY of the bonuses I am offering including creating a professionally designed media one sheet FOR YOU, launching your podcast channel on iTunes FOR YOU, and much more. More importantly, the booking agencies won’t take the time to show you how, or even have the expertise, to guide you to monetize the visibility you’ll receive when you appear on shows. And, yes, you can certainly try to book yourself on podcasts. However, seldom do cold pitches get people booked and why try to do this on your own and save a few dollars when I will literally walk you to the front of the line and give you an unparalleled forum to connect with 40 of the world’s top podcasters and get booked on their shows… on the spot?! Keep in mind that just one appearance will likely pay for your investment many times over and the value of everything else you’ll receive when you enroll in Profiting From Podcasts should make this an easy YES for you. How do I know if my message or pitch is compelling? This is one of the topics I cover early on in the training. I’ll make sure you have a compelling pitch that gets you booked! Plus, you can get further help through the Facebook community, my monthly open office hours sessions and the four pre-event training sessions I conduct prior to The New Media Summit. Yes! The great thing about being a podcast guest is that the host does all of the hard work FOR YOU including all the technical stuff you simply don’t need to bother yourself with. You just have to show up and share your message (that’s why you can reach thousands of people in only a couple of hours per week). They take care of EVERYTHING else. I’m super busy. Can I do this? Do I need expensive equipment to make this work? No. I recommend investing in a decent USB plug-in microphone (about $50), but you don’t even need this out of the gate. Your phone can ABSOLUTELY suffice as your microphone for now. How will I know which shows make the most sense for me to appear on? My core training covers this process step-by-step. Plus, I show you how to position and pitch yourself so that you get booked on the shows YOU WANT to appear on. Can I make money as a podcast guest? In a word, YES. But… you don’t get paid to be a podcast guest. Making money as a guest requires you to understand how to BOUNCE listeners into your ecosystem so that you can open a dialogue with them and shift them from being passive listeners into being active prospects. I am a master at converting appearances into money. I’ll show you exactly what to do and guide you to create your very own $1,000 FUNNEL that converts EVERY TIME you appear on a show. How does appearing on shows help me grow my business? First and foremost, appearing as a guest elevates your credibility, authority and visibility. These are three crucial steps on the path towards building the ever-important know, like and trust factor with prospects. I show you precisely how to expedite this process. And, once people know, like and trust you, selling books, enrolling coaching clients, filling live events and more is a breeze. How much time does it take to prepare for each show and conduct an interview? Unlike radio and television appearances that average approximately four minutes, the average podcast interview is 62 minutes! This provides ample time to share your mission and message and develop rapport with listeners. Before your interview, I do recommend listening to a handful of episodes to get a sense of what the show is about and how to best position your expertise as it relates to the show flow. You can easily get a sense of what a show is all about in just a few minutes. So… the long answer to your question is ~ 15 minutes of prep and allocate an hour for the interview. Yes. Once you enroll, book your call with me (if you’re one of the first 50 — we’ll let you know if you are) and get started with the training. ARE YOU READY TO GAIN IMMENSE VISIBILITY, BECOME A WELL-RESPECTED EXPERT & IMPACT MORE LIVES WITH YOUR MISSION & MESSAGE? ENROLL NOW! In the next 3 months, what will you do to double your business? If you’re happy staying at your current level, that’s great! Or if you know precisely what you’re doing to grow by 2x in the next 3 months, then this program probably isn’t for you. my question is: Do you know how to get from here to where you want to be? Reading this they will “think about it”… hide this page behind a sea of Chrome tabs… and then convince themselves their situation is “fine” as the countdown timer hits zero. What follows? They’ll waste dozens if not hundreds of hours over the next few months trying to run some ads here… ask for some referrals here and there… and continue to be lowballed and ghosted by clients. Meaning? They’ll be right where they started. They’ll get discouraged, and resort to special offers and discounts, lowering their value even more out of sheer desperation. Some will continue to “pass-by”… others will wonder if a 9-to-5 is a better choice after all? Others will overspend. They will hire $5,000/month PR agencies they don’t need, get booked on some outlets and will get dribs and drabs of attention… but, they won’t know how to direct that attention. To take full advantage of it. Or, how to move listeners from passive prospects into active buyers. And… They’ll be right where they started. Instead, you will try out Profiting for Podcasts today. You will go through the training videos, and join the live sessions, arming you with a proven, battle tested game plan. Turning you into a PR machine. You’re getting invited on top expert high visibility podcasts. Your reputation grows. You attract high quality leads thirsty for your products and services. You’re able to charge higher fees. To reach more people. To enjoy the true reasons you started your business in the first place. This can only happen if you take the first step and invest in yourself. A year from now, you’re going to be a year older. What are you going to do? One person has the power to change the world, impact millions of lives and leave a legacy for lifetimes to come. That person is… you! I look forward to helping you share your mission and message with the masses, secure the significant visibility you absolutely deserve and get paid extraordinarily well for what puts fire in your soul. I hope you choose to join us. Register now. I’ll see you on the inside. P.S. Profiting From Podcasts is only open for registration to new students ONCE per year. Don’t wait another year to secure the visibility you rightfully deserve and monetize your expertise. I look forward to serving you.